The fact is children are becoming increasing overweight and are less physically active. In the United States, 17% of children are obese and 5% are severely obese. Unfortunately, as obese children become obese adults, many are experiencing health problems such as diabetes, high blood pressure, high cholesterol and cardiovascular disease. 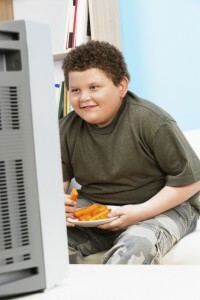 Media time including television watching, video gaming and computer use has been identified as one of the key factors contributing to obesity. It is estimated that children ages 8 – 18 spend approximately 45 hours per week in front of a media screen. During this time, children are exposed to commercials and food marketing. Studies show that young children have a hard time distinguishing between advertising and programming content. Research has found that there is a strong association between rates of childhood obesity and increased advertising for non-nutritious foods. Parents who worried about television’s influence on children’s behavior, now worry about the influence on their weight and health. Media advertising of unhealthy foods contributes to obesity by influencing children’s food preferences, requests, and diet. There has been a huge increase in the number of food products being marketed to children through cross-promotions with popular TV and movie characters such SpongeBob, The Avengers, and super heroes. According to one study, 72% of all advertisements aimed at children are for candy and snacks, sugared cereal, sodas, and fast food. Children, with their remarkable ability to recall ad content, influence what their parents buy at the grocery store by what the industry has termed “the nag factor,” or how much pressure kids put on parents to buy what they want before the parent gives in. The majority of commercials aimed at children are for high-fat, high-sugar or high-sodium foods with little or no nutritional value. Healthy foods, such as fruits and vegetables are rarely advertised. Product placement in children’s TV shows and movies, known as “advergaming,” strongly influence children as well, as children have the ability to remember the product after seeing it only one time. It has become acceptable to eat at any time and food is available 24/7, essentially creating a food carnival. It becomes a question of an individual’s will verses their environment. Research shows a direct link between television food advertising and mindless eating. Yale University research shows that children aged 7 – 11 who watched a half-hour cartoon that included food commercials ate 45% more snack food than children who watched the same cartoon with non-food commercials. This increased amount of snacking can lead to a weight gain of nearly 10 pounds per year unless countered by an increase in physical activity or a calorie reduction brought about by a decreased intake of other foods. It appears food advertising triggers automatic eating regardless of hunger, making it a significant contributor to the obesity epidemic. “Research shows a direct and powerful link between television food advertising and calories consumed by adults and children,” according to lead author Jennifer Harris, director of marketing initiatives at the Rudd Center for Food Policy and Obesity at Yale. Mindless eating in front of the TV doesn’t just lead to an unhealthy diet, it can lead to a less healthy life overall. This is just one of the compelling reasons to turn off the TV and eat at the table where kids can focus on eating and enjoying the company of their families. Eating habits are learned behaviors. Children don’t necessarily understand that a consistent diet of chicken nuggets, french fries and sodas is not healthy. Most parents know that their kids are under continuous assault by corporate food advertising. Parents can record their children’s favorite shows and edit out the commercials. Turning off the TV is one way to encourage kids to be more active. As parents, we need to be good role models by being active ourselves, lining our cabinets with healthy foods and practicing what we preach. Parents who are active and who eat nutritiously are going to have a strong influence on developing their children’s healthy lifetime habits. The key is to not only get children to eat healthy foods but also to enjoy healthy foods. For many children, this may be just a matter of exposure and giving children opportunities to experience foods. When it comes to helping your child to love new foods, be persistent but not pushy. Keep it positive and continue to offer the foods until your child begins to taste and eat them. Remember, marketers “pester power” is strong but parents have the ultimate decision-making power. Carlson For Kids Chewable Vitamins and Minerals by Carlson Labs – One tablet taken daily helps to ensure your growing children receive the nutritional support they may need to maintain healthy immune function and promote normal growth and development. Little One by Metabolic Maintenance – A one-per-day multivitamin created specifically for children ages 6 -12 to meet their unique nutritional needs. Each very small capsule contains only the finest ingredients in the most bioavailable forms. Nordic Berries by Nordic Naturals – A chewable multivitamin that supports growth and development during the early years. This entry was posted in Health & Wellness, Health Tips and tagged Carlson For Kids Chewable Vitamins and Minerals by Carlson Labs, Little One Little One by Metabolic Maintenance, Nordic Berries by Nordic Naturals, obese children, obesity, Professional Supplement Center, Vitamins and supplements, www.professionalsupplementcenter.com. Bookmark the permalink.